Danny Lee taps in for the win. Danny Lee won the Greenbrier Classic on Sunday in West Virginia, outlasting Robert Streb, Kevin Kisner and David Hearn in a playoff for his first PGA Tour victory. As always at the Greenbrier, it seemed like pretty much the entire field had a chance to win this thing after the cut and at one point late on Sunday, there were 21 players within two shots of the lead. Russell Henley put some pressure on early, getting into the clubhouse at -12, but there was pretty much no chance that would hold up with the amount of players still on the course. Surprisingly, five of the final six players to tee off on Sunday ended up being non-factors, with the most shocking example coming from Justin Thomas, who actually started out pretty hot with three birdies in his first eight holes before making a bogey on the par-4 9th. He then followed it with a four putt double bogey on 10 and deposited two balls in the water on the par-4 16th, completing his ejection from the round. Kisner ended up getting into the clubhouse first at -13, officially knocking Henley out of contention, and he was later joined by Streb, Lee and Hearn as they went to the par-3 18th for extra holes. Unfortunately, both men missed the fairway badly on the 17th, forcing layups. Hearn had almost no play and actually had to lay up a second time, giving Lee the distinct advantage after he landed his approach on the front of the green. Two putts later, Danny Lee had his first PGA Tour win. Two-year exemption on the PGA Tour, which should allow him to not play as often if he so chooses. Exempt into the Open Championship at St Andrews. Moves up to 78th in the Official World Golf Rankings, up from 158th. Moves into 15th place in the FedEx Cup. I know people aren’t going to want to hear this after seeing Tiger finish tied for 32nd, but this was a good week for him all things considered. Yes, the Greenbrier typically plays as one of the easiest courses on the PGA Tour, but when you remember that the last time we saw him, he was cold topping balls from the fairway at the U.S. Open, I think it’s fair to say that there’s been some progress here. The double bogey above came in Thursday’s opening round, and the big number is still coming into play far too often as we saw on Saturday when he went OB on the 11th from the tee, but for the most part, his struggles this week came on the greens. At one point on Golf Channel’s pregame show on Saturday, Tiger was ranked third in proximity to the hole for the week, which shows you how well he was hitting his approaches and it’s a far cry from where he was just a few weeks ago at Chambers Bay. On Sunday, he played his first bogey free round on the PGA Tour since the opening round at the Barclays back in August of 2013. Now, what does this mean for the Open at St Andrews? I have no idea, but a few weeks ago, Tiger did mention that he was staying committed this time to the swing changes that he and Chris Como had been discussing, so maybe this is the start of something positive. Or maybe it isn’t. It’s impossible to know at this point. Big Cat fired a 66 and I saw a girl at Panera wearing a BEBE shirt. Yep, things are pretty good over here in 2006. Tiger nearly jars one twice on the 17th. Robert Streb hits the 30 footer with his wedge. David Lingmerth with a club drop. 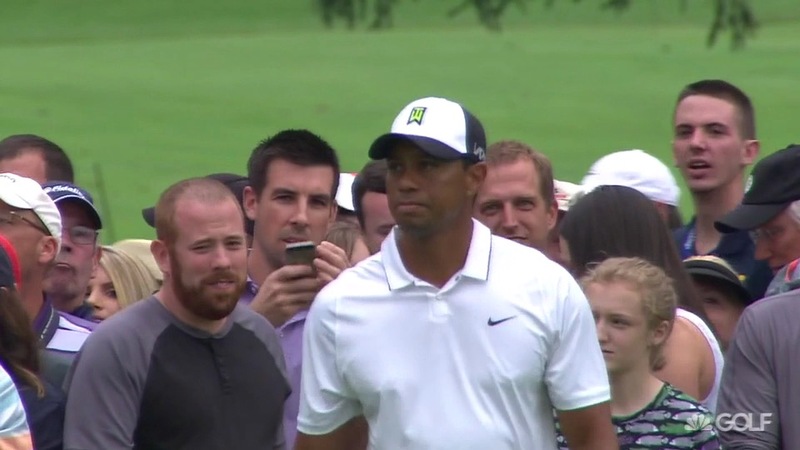 Please don’t wear this hat again, Tiger. This guy is a big Jonathan Byrd fan. 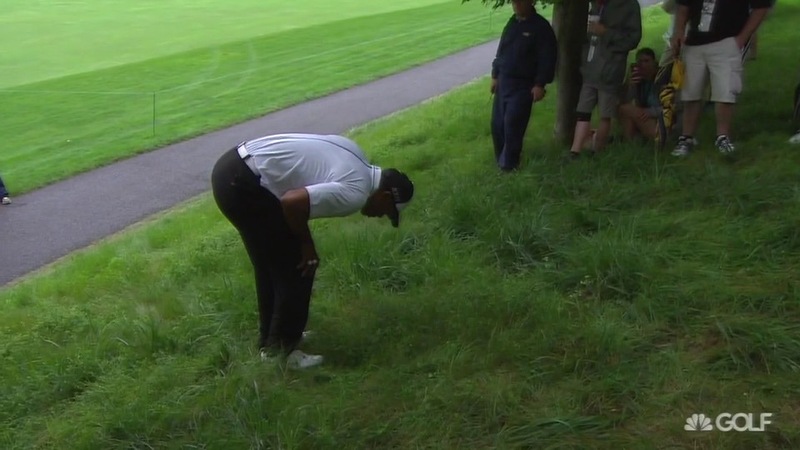 Tiger’s ball is in there somewhere. Notables to miss the cut: John Daly, Jonas Blixt, Steve Stricker, Marc Leishman, Charles Howell III, Bill Haas, Angel Cabrera and Webb SImpson. Peter Uihlein withdrew during the first round, citing a neck problem. He was playing on a sponsors exemption since he plays almost exclusively on the European Tour, which is where he’ll try to tee it up next week at the Scottish Open. Robert Allenby pulled out midway through his second round after having issues with his sciatic nerve. He’s currently in the field at the John Deere Classic next week. Will Mackenzie didn’t make it out for the final round on Sunday, citing a knee injury. Watching Robert Streb play the entire back nine with no putter, and seeing him drain so many putts with a 56 degree wedge, was entertaining if only because I’ve broken a putter in the exact same way by casually tossing it towards my bag and having the head pop off. If I were him, I would have kept the backup putter in the locker for the playoff. Kevin Kisner has now lost all three playoffs he’s been in this season. Win has to be coming soon because you can’t keep putting yourself in this position repeatedly and not break through, but man, it’s tough to even think about being 0-3 in one year. Feel like David Hearn had the most to gain from winning the playoff just because of the impending anchoring ban next year. The two year exemption would have bought him some time to figure it all out. I’d be absolutely shocked if Jason Bohn didn’t end up working for Golf Channel in some capacity once his playing career is over. In addition to Lee getting into the Open, Hearn, Greg Owen and James Hahn all ended up earning a spot. It’s John Deere Classic week on the PGA Tour and the field isn’t great, but it’s passable and Jordan Spieth is back to headline the event. The bigger tournament to watch next week is the Scottish Open on the European Tour, held at Gullane where they are apparently playing a composite course made up of holes from numbers 1 and 2. Do yourself a favour and get up to watch.